"Excuse me, Miss. Being such a hot day and all, wouldn't you like to rest and have some tutti-frutti?" Children on Their Birthdays is another of those idyllic and golden nostalgic family throwbacks, in the sugary vein of an uber-Rockwellian Stand By Me, where we are constantly reminded that the world was seemingly far better and more kindly generations ago. This time it's the sleepy town of Medda, Alabama, in 1947, and first-time director Mark Medoff (playwright of Children of a Lesser God) layers on oodles of soft-glow goodness and thick-as-molasses Southern accents as he glosses over the rougher and more caustic spots of Truman Capote's biting short story, on which the film is based, and reassembles it into a whitewashed bit of easy-does-it family entertainment. The lives of a pair of thirteen-year-old best friends, Billy Bob (Joe Pichler) and Preacher (Jesse Plemons), are turned on their ears by the arrival in town of a mysterious and unusual young girl named Lily Jane Bobbit (Tania Raymonde). The two boys are both immediately enamored by the wise-beyond-her-years Lily Jane, and Billy Bob and Preacher find themselves battling for her affections, at the price of their friendship. Meanwhile, a con man, played by Tom Arnold, shows up and sets up a sting to bilk the townsfolk out of their cash, and as the leisurely paced story plays out, Billy Bob, Preacher and Lily Jane must work together to right the wrong. As added dramatic padding, Sheryl Lee is Billy Bob's war-widowed mother, Elinore, who in between hanging clothes out to dry or tending to her prize-winning flowers, is gently wooed by mechanic/sheriff Speedy Thorne (Christopher McDonald). The children who play the three leads do pretty solid work here, anchored by Tania Raymonde. Raymonde, who played Malcolm's comically odd and overbearing girlfriend Cynthia on Malcolm In The Middle, is equally odd here (but certainly no less charismatic), even as she is forced to constantly spout gobs of long, sage dialogue in an overly-enunciated Southern twang, meant to make her appear worldly and proper, though a lot of the time it just sounds forced and unnatural. Still, she is entertaining to watch, and the wholly believable and laid back performances of Joe Pichler and Jesse Plemons just serve to make Raymonde's Lily Ann that much more exotic, at least to thirteen-year-old eyes. 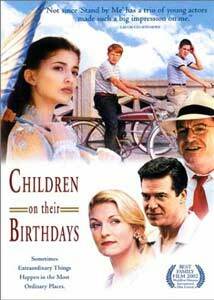 Aside from the possible arguments about the tweaking done to Capote's original story, and the subsequent mellowing of his sharp Southern Gothic tale, director Medoff's Children on Their Birthdays is a muggy and sappy bit of down-home corn that is suitable for the entire family, if said family has an affinity for slow-moving nostalgic slice-of-life recreations. It's easy to mock the wholesome fluff of a film like this, but even amdist the sometimes laughable accents, there is an earthy appeal that if not endearing, is at the very least hypnotic. The look of the film is spot-on, and there is a likeable gee-whiz charm to the whole affair, even if it does move at a snail's pace. Image Transfer Review: Artisan throws out a 1.33:1 full-frame transfer, which seems odd for such a visual storybook of a film. As for the transfer itself, black levels are a little muddy, but the colors are exceptionally bright and vibrant. No noticeable or glaring print blemishes or artifacts were evident. The cropped presentation is not awful, but most of the charm of Children on Their Birthdays is in the set dressing and locales, and that has obviously been trimmed somewhat by Artisan for this release. Why? Audio Transfer Review: The subtle 5.1 surround track is the preferred option here, and while it does not over do rear channel cues, there are enough sporadic moments of cicadas, vehicles or the ever-present period music to create a suitably full soundstage. Dialogue is anchored in the center channel, with occasional and unobtrusive imaging across the fronts. A less robust 2.0 English surround track is also included. Extras Review: Artisan has provided the usual quickie fluffumentary, and if you've seen one, you've seen 'em all. The Making of Children on Their Birthdays EPK (10m:32s) features the usual rah-rah soundbites intercut with behind-the-scenes footage. Bottom line, no real revelations, but plenty of happy talk. The website for the film features a downloadable study guide for educators, and it seems odd that it wasn't included here as a DVD-ROM accessible PDF. The film itself is cut into 24 chapters, and also features a theatrical trailer and optional subtitles (English, Spanish). This took Best Family Film of 2002 honors at the Worldfest-Houston International Film Festival (ok, it's not Cannes or Sundance), and as family flicks are hard to come by these days, the saccharine-laced Children on Their Birthdays is certainly not a completely bad choice. The three children who play the leads do an outstanding job, and the look of the film has that familiar golden glow and small town warmth that nostalgic outings like this require. A little slow moving in spots, with some bad Southern accents, but consider this a safe family night rental.